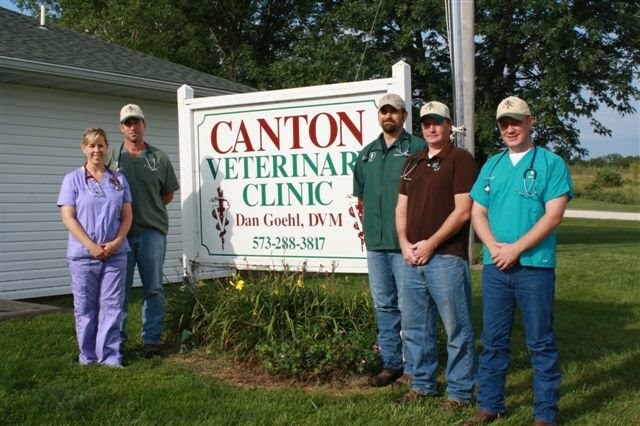 Canton Veterinary Clinic has been serving the northeast Missouri area since November 1998 in our current location. We provide exceptional care and services for all animals large and small. We are located two miles west of the Highway 61 and Highway 16 junction at Canton, Missouri. Click here to view us on Google Maps. Doctors Rachel and Dan Goehl, David Hudson, and Joe Iliff. Dr Andrew Perrine not pictured. This email address will connect you directly with the desk at the Canton office. This email address will connect you directly with the desk at the Palmyra office. Canton Veterinary Clinic, LLC offers for your convenience the ability to contact the front desk of the Canton office via cell phone texting. You may text us at (573) 406-9527 and your text will be answered during business hours. We thank you for your continued business and we hope this gives you one more low hassle way to communicate with the front desk. As always feel free to call us at (573) 288-3817 or email cantonvet@cantonvetclinic.com . Please note this is not for emergency care. Manage veterinary expenses, and take care of the rest of the family too. We offer Care Credit, which can be used on all members of the family.